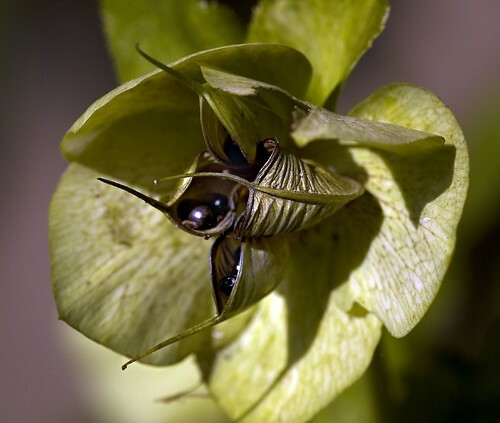 Hellebore Gone to Seed, photo by Harold Davis. View this photograph larger. Strange that so beautiful and lush a flower should go to seed and end looking like an alien artifact. 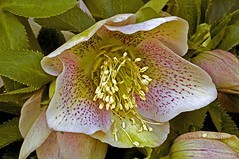 A stranger tail still: the seeds of the helleborus flower are spread in my garden as part of the trail of snail slime. As a gardener, snails are my nemesis. This is the first thing I’ve learned about snails that makes me sympathetic to these slimy creatures, and to believe in them as part of Disney’s “great circle of life”! Venus Fly Trap Digesting, photo by Harold Davis. View this photograph larger. Parenthood has led me down many unexpected avenues: towards emotional and spiritual growth, endless nights without sleep, hospital vigils, the sweetness and imagination of little kids, and an impossible level of mess. But I never expected, as my wife put it the other day, to be pimping for a plant. 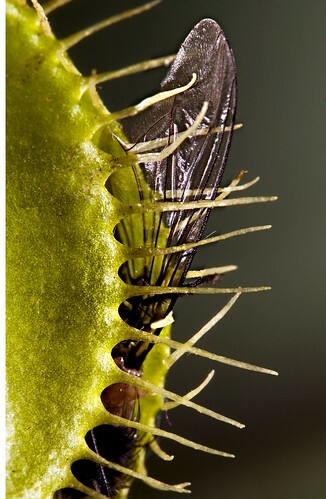 The plant in question is this carniverous Venus fly trap, dionaea muscipula. We also as of a few days ago have a meat-eating pitcher plant, nepenthes alata. 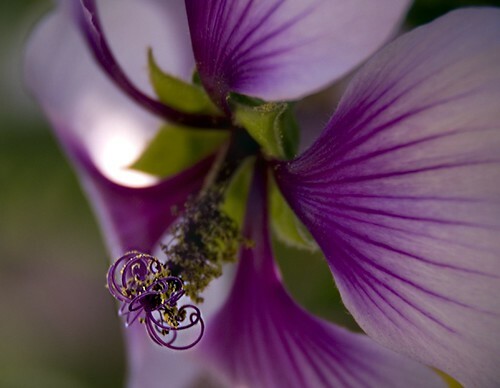 Mallow, photo by Harold Davis. View this photo larger. I’ve been watching my neighbor Brett’s mallow tree with great interest. Not because I covet a mallow tree, or his mallow tree. Not because of the mallow’s supposed medicinal properties. Which actually boil down to having high concentrations of mucilage, as in the marshmallow. 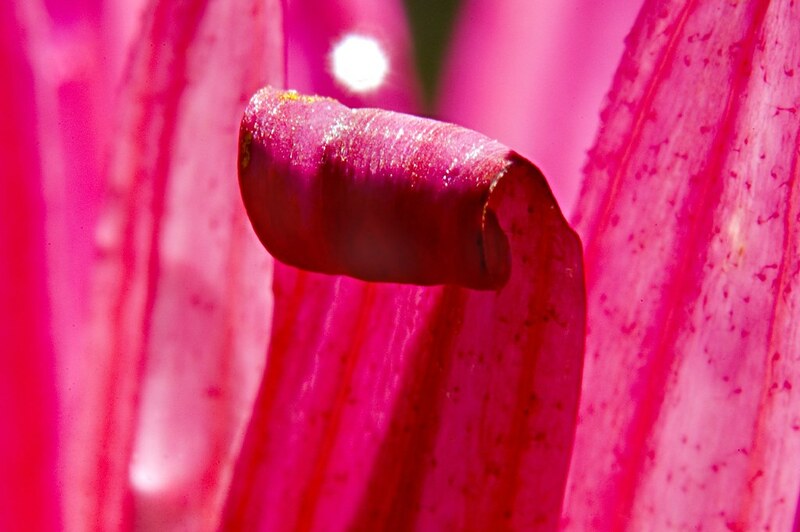 Mucilage is a thick gluey substance produced by most plants and some microorganisms. Mucilage is an exopolysaccharide—a polymer composed of sugar residues and secreted by a microorganism into the surrounding environment. Mucilage is what’s used by carnivorous plants to trap their prey, and we happen to have a couple of new carnivourous plants to the great delight of the kids. Anyhow, to get back to the mallow, the thing that atracted me over the past couple of weeks is that about 5PM the afternoon sun is just at the right angle over Brett’s house to backlight the flowers on the trees. My Nikon 18-200 vibration reduction lens with an extension tube and close-up filter makes an excellent way to get macros with a sharp center of focus and a nicely blurred background. Particularly into bright light (here’s another example). An attractive blurred effect (usually combined with fully sharp image elements) is now fashionably called bokeh—I plan to write more about bokeh later. The point for me of this mallow photo, which is perhaps best viewed larger, is the contrast between the sharp curliques of the flower center and the elegant angel wings of the less-focused flower itself. 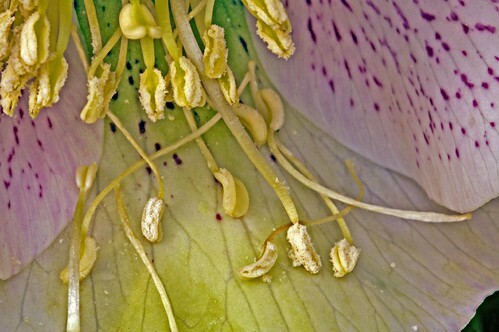 Columbine, photo by Harold Davis. View this photograph larger. This columbine in my garden is unusual because it is upside down, for a columbine. Upside down for a columbine means that the flower faces up, rather than over and down like an elegant hat. 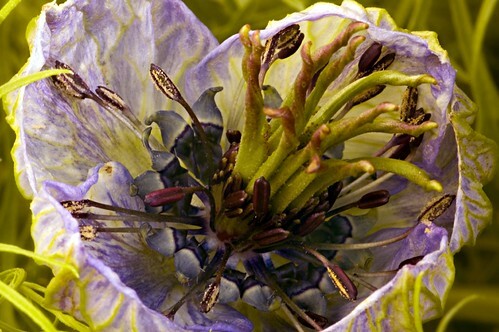 One of the nicknames for this flower is “Granny’s Bonnet.” Hardly an elegant hat, and hardly an appropriate name when you are face up (upside-down, that is, for a columbine). An upside-down columbine makes me happy, because it is easier to photograph. I can simply put the camera on my tripod, and aim down at the flower. I don’t have to lever myself underneath the flower. I can be any distance I’d like from the flower. And, upside-down columbines that face up move less than normal columbines—because the stems are stabler. This makes it easier to photograph them at small apertures for long time exposures, as I did in this photo (f/40). 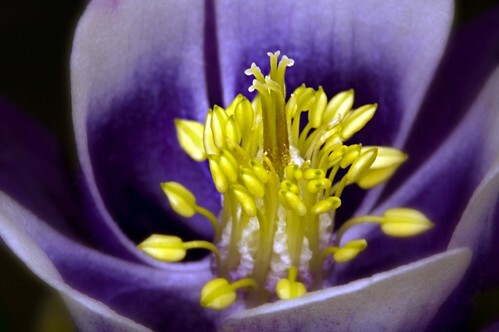 A member of the widely varied, far-flung ranunculus family, the columbine seems paradoxically to have been used both to symbolize cuckoldry, and the innocence of the holy dove (columbine comes from the Latin word for dove). Flower of opposites, I like it best upside-down like the one in this photo, with secrets exposed to the world. Where Did the Ladybug Lose Her Spots? 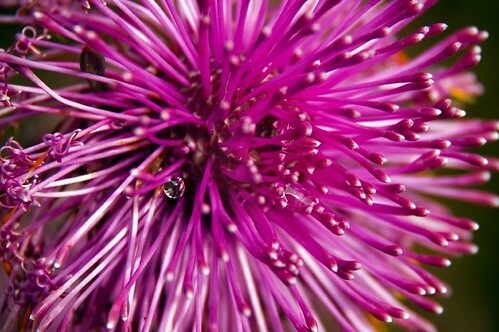 Ladybug, photo by Harold Davis. View this photo larger. Ladybug, oh ladybug, where did your spots go? I don’t see them anywhere, and I miss them so. Julian found this ladybug in his garden and brought it in to me. We photographed it with the same technique used on the wasp. Julian served as ladybug wrangler, helping me to make sure that this hyperactive insect stayed more-or-less where I could focus on it. Don’t worry, no ladybugs were harmed in the commission of this portrait: we set her free after we were done. I find the face of this ladybug definitely sinister. I’m sure if I were a tasty plant parasite, I’d be very afraid. 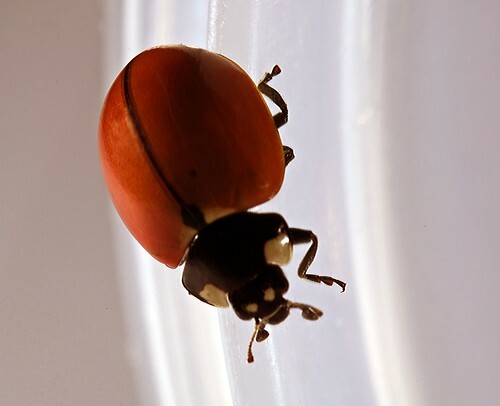 So why are ladybugs cute and cuddly? Why do these beetles that display a death’s head get a free pass? Good public relations campaign? Here’s an earlier ladybug photo with Julian-insect-wrangler’s hands. 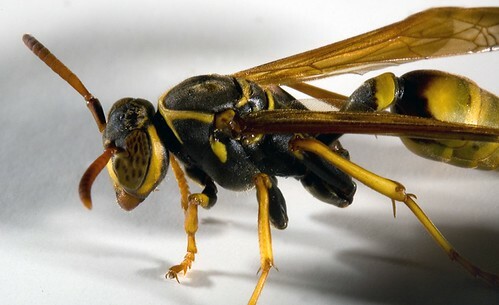 Wasp 2, photo by Harold Davis. View this photograph larger. OK, well not really! This is a wasp of the insect kind, of course. This guy (or more likely, gal) was crawling up our living room window. I caught her using a glass and a paper plate, while the kids gawked and wanted to look (but were a bit scared). Unlike my last wasp photo session, where the wasp seemed to be almost sedated, this wasp was alive and (it seemed) pretty upset. I got everything setup, with the camera plus 200mm macro lens plus extension tubes on a tripod and the Nikon macro flash rig. I positioned the two SB-200 strobe units off camera at 180 degrees to the camera (one aimed towards the head and the other the tail of the wasp), set the aperture to as small as it would go (f/40) for maximum depth-of-field, and focused with the wasp still under the glass. (Focusing is no joke when one is this close: it can be very hard to get in the initial ballpark because landmarks are absent.) The plate seemed to make a good background. At first, I got Phyllis to lift the glass off and put it back on before the wasp could get away. Firing the strobes really seemed to agitate the insect, and Phyllis didn’t have much stomach for being a “wasp assistant.” (Picture the kids gawking and making comments in the background.) So after Phyllis resigned, I did all parts of the job myself for a couple more shots (this was one of them). I checked them out on the computer, and decided I could release Ms. Wasp (outside, of course). This really excited the kids, but they wanted to make sure all our windows were shut so the wasp couldn’t get back in. I sort of wonder why people are so squeamish about wasps, but looking at this photo I understand. But for the scale, a truly terrible monster. Beautiful creation of nature, even so. 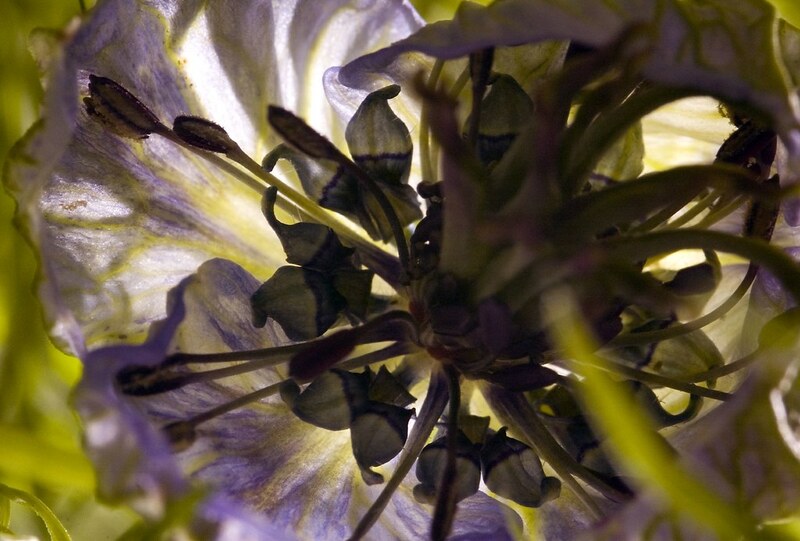 Love-in-a-Mist 2, photo by Harold Davis. View this photograph larger. Personally, I’m not so sure I see the human-female sexual resemblence. 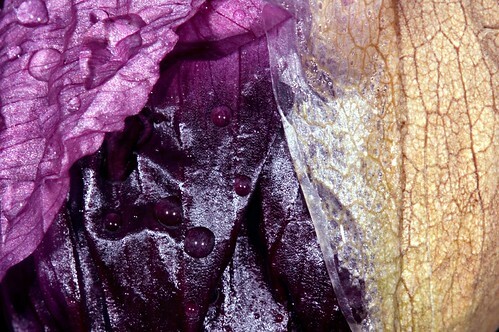 Although all flowers are overtly sexual, with organs there for all to see in glorious color. The photo above lit from underneath with two macro flash units, the one below (which does seem to me to resemble a heart) was taken using ambient sunlight. Sunshine in the Gazania Forest, photo by Harold Davis. View this photograph larger. Gazanias, also called African Daisies, are easy to grow around here and gourgeous. The flower, which is apparently called Rankbotterblom by Afrikaaners and Ububendle by the Zulu, makes a glorious Berkeley ground cover. These photos were taken with my 105mm macro lens (now returned from the shop), and my Nikon macro flash setup. I stopped the aperture down almost as far as it would go for maximum depth-of-field. 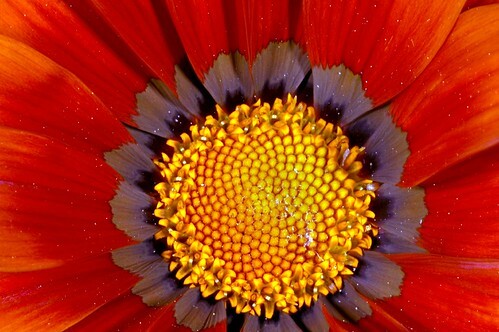 Here’s one of my earlier photos of a Gazania. Gosh, I love these unpretentious but beautiful flowers! Coral Bells, photo by Harold Davis. View this photograph larger. I’ve never before appreciated the wisdom of the advice to use smaller-sized memory cards rather than a single larger one. What happened is this. I was photographing these very small, equisite flowers (coral bells, heuchera, also called alum root) in the shade bed of our garden. Conditions were perfect. There were big water drops on the tiny flowers, the lighting was bright cloudy, saturated to the max, but not windy. In short, conditions were perfect for extreme macro work with flowers and water drops. I used my Lexar 2 Gigabyte Compact Flash (CF) high-speed (80X) card, which stores a bout 180 RAW images from my Nikon D70, and almost filled the card. I had used this card without problem for about a month. Work done, and thinking I’d made some first rate captures, I headed inside to the computer. My first intimation of disaster was that when I loaded the card in my Compact Flash reader, my computer didn’t see it as a drive. Well, I thought, the camera seemed OK with the card. Planning a direct USB connection, I put the card back in the camera. But when I turned the camera on, instead of displaying the number of exposures, an HA appeared on the display. As a penultimate last-ditch measure, I tried the Image Rescue software that came with the Lexar card (I think Lexar bought this worthless piece of software from Corel). But to my not-very-great surprise, the software couldn’t see the card at all. If you can’t even see something, how can you rescue the data on it? You can’t. This was on a Sunday. An online chat service was available at Lexar technical support. I told my story. The service rep wrote me up an RMA number and said they’d replace the card and try to retrieve my images. No guarantees, but damned nice of them to try. What are the morals I’m deriving from this sad-but-true story? First, I have my fingers crossed that Lexar may be able to recover my photos. Second, I’m slightly inclined at this point to favor Sandisk CF cards over Lexar. I certainly wouldn’t buy a really off-brand card. Third, I will keep to smaller cards. Why put all one’s eggs (photos) in one basket (memory card)? And, overall, I’m now paranoid about memory cards in a way I haven’t been about anything since I accidentally opened (and ruined) a box of my unprocessed 4X5 negatives. Yes, these computer dudes are fragile too. In the afternoon, trying to make up for lost work, I photographed the coral bells again (photo above). 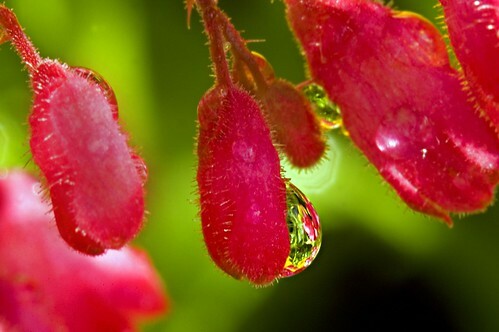 I like the reflection in the water drop in this photo, but these are artificial water drops from a hose, not raindrops. And the lighting was sunny and bright, not overcast saturated. And the wind was blowing. It seems that perfection is only to be found in one’s lost photos! Is Nature’s Imperfection Perfect Enough? Dragonfly, photo by Harold Davis. View this photograph larger. I photographed this dragonfly last summer in Blake Garden. I had a cooperative model, and basically this was a grab-and-shoot situation. I do find, however, that automatic focus usually doesn’t work quickly enough for this kind of situation. I’ve lost a number of photos waiting for auto focus to decide where it wants to come to rest. So it’s worth remembering to manually focus when speed (and accuracy) are critical. When I saw this image in my archives, I was excited and immediately used the RAW plug-in to open it in 16-but mode in Photoshop. 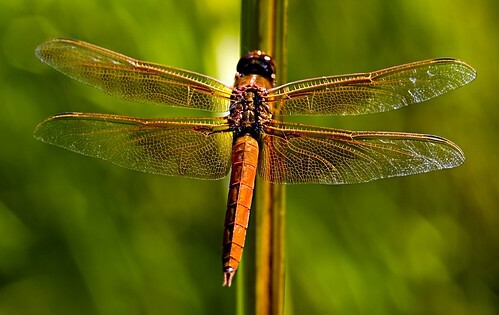 In Photoshop, I saw that three of the dragonfly’s wings were nice and sharp, but one wing was a little on the fuzzy side (the upper left wing). Worse than the slightly out-of-focus aspect of this upper left wing, there was a long white streak in the out-of-focus area of this wing. I couldn’t quite tell if it was a small tear in the wing, or highlight blow-out from the sun. In any case, for me it was enough imperfection to spoil the image. Rather than abandoning the photo, I carefully used the Photoshop Clone Tool to add color back into the wing, and hide the imperfection. Was it wrong, morally or ethically? 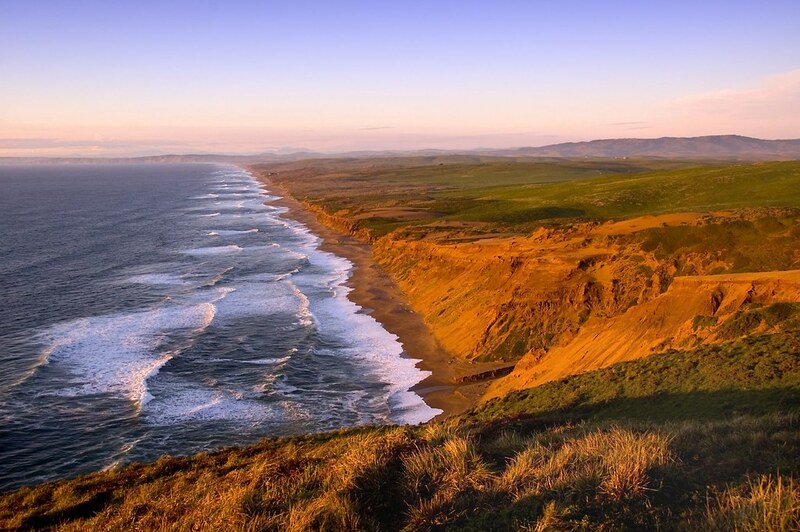 Is it a bad idea to retouch Mother Nature? I don’t think so. I think it is all about the final image. 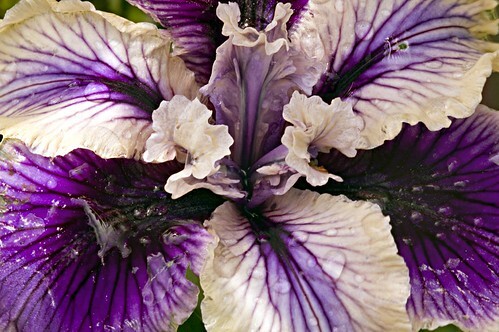 Iris, photo by Harold Davis. View this photograph larger. 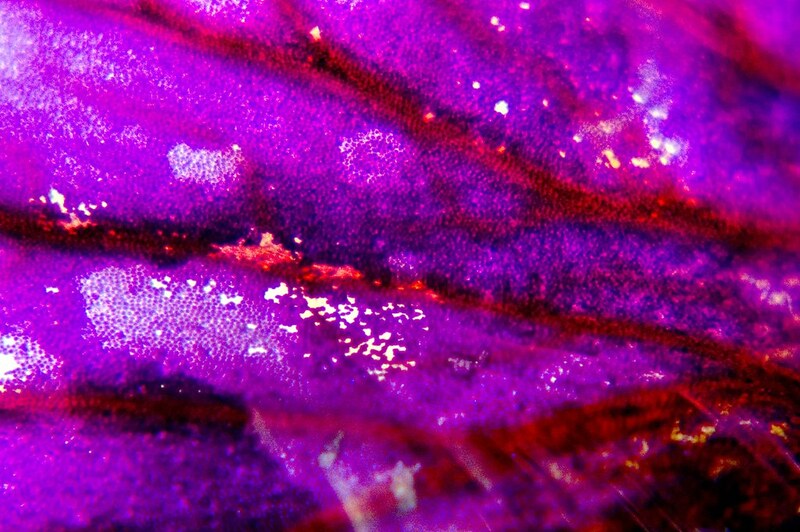 Here’s the same Iris photographed through the leaf with a flash (scroll to the bottom), and some of my earlier Iris photos. 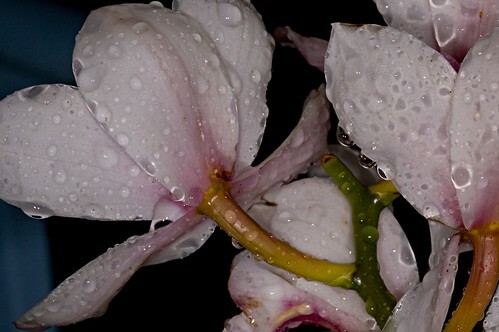 Flowers Cry Too, photo by Harold Davis. View this photograph larger. This photo, of my isopogon formosus, was taken with the Nikon macro flash kit. Since the flowers of this plant are on very long stalks, they move in the slightest breeze. The lowlight conditions following the rain would have made it impossible to photograph with any degree of depth-of-field without the flash. 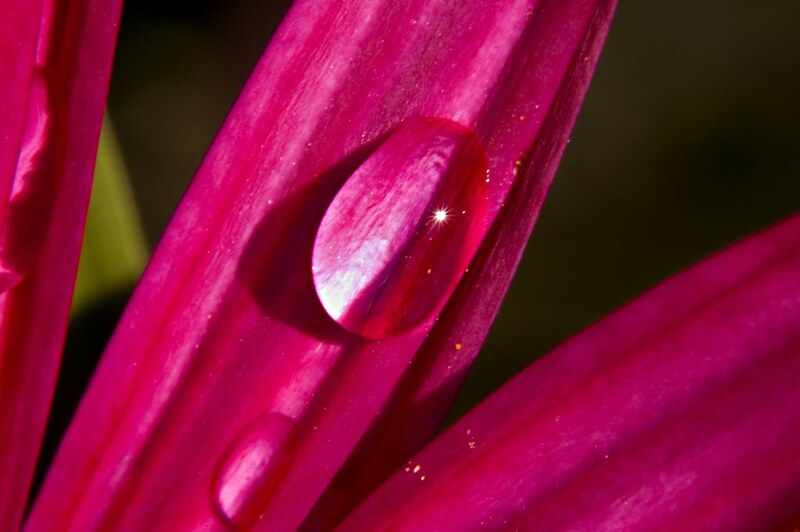 I like the scale contrast in this photo: the way the small drop of water rests within the flower. It makes one think. How big is this flower, really? 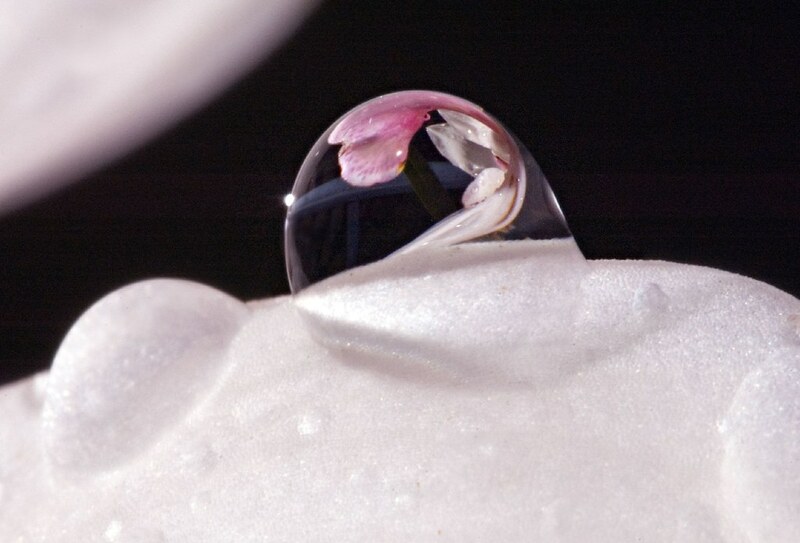 And, how small the water drop? 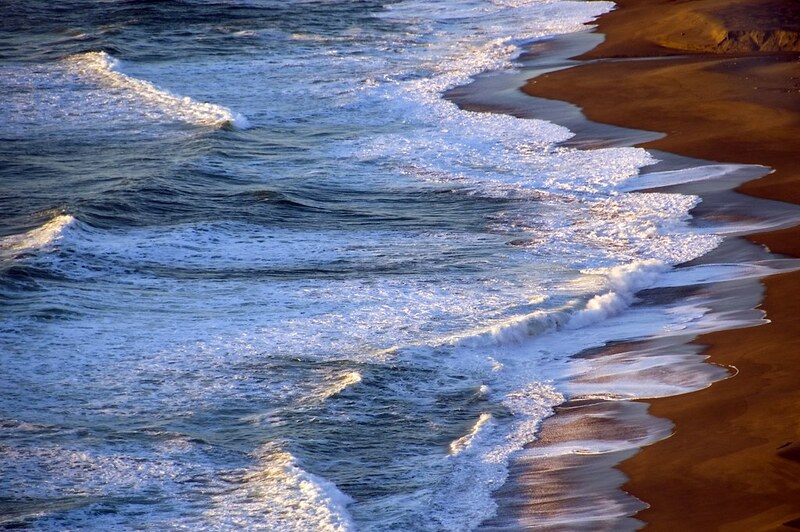 Waves on the Shore, photo by Harold Davis. View this photograph larger. Orchid Water Drop, photo by Harold Davis. View this photograph larger. I recently bought a Nikon Close-up Speedlight Remote Kit to try out adding flash capabilities to my macro repertoire. The kit comes in two versions. The R1, which is what I bought, is intended for dSLRs that already have a flash, such as the D70 or D200. With the R1, the on-board flash serves as the master controller, sometimes called a “commander,” that sets off the two supplied SB-R200 flash units via wireless. In contrast, the more expensive R1C1 kit is intended for Nikon SLRs that don’t have a built-in flash (such as the D2X). The R1C1 kit essentially adds an independent SU-800 wireless commander unit to the contents of the R1 kit. Both kits are full of little gizmos, and come in a nice leather case fitted with wonderful little compartments, if you are into that kind of thing (as I am!). Despite a daunting array of minature components, and instructions that are essentially unreadable, it turns out that there’s not too much involved with basic operation of the close-up speedlight kit–and a great deal involved with sophisticated use of wireless speedlight components. Set the camera to aperture-preferred metering, select an aperture, and you are good to go. 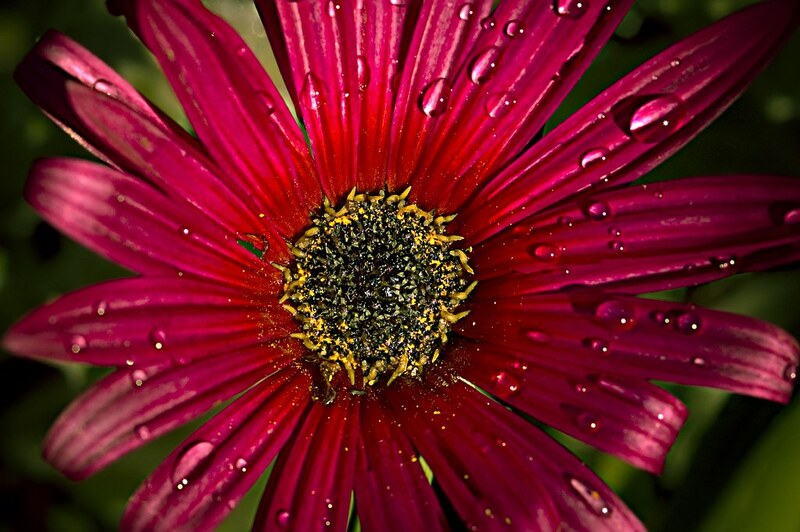 Focus–personally I never use auto-focus with my macros, I don’t think it works all that well–and shoot. Whether the aperture you selected lets in enough light depends on (besides the aperture) your distance from the subject, the quantity and positioning of the speedlights, and the ambient light levels. The only real caveat is that at least with my 200mm lens this setup isn’t manageable without a tripod. Which leads me to a brief digression on why sophisticated use of this kind of setup is complicated. First, you are likely to want to get one or both units off the camera. You can handhold them, or mount them on their cute little stands. In the long run, lighting a macro composition with flash is like lighting a theater: with great control comes great responsibility. If you really want to get into this kind of work, you’ll probably want to acquire a couple of additional SB-R200 units, and likely some “big Daddy” SB-600 and SB-800 units as well. 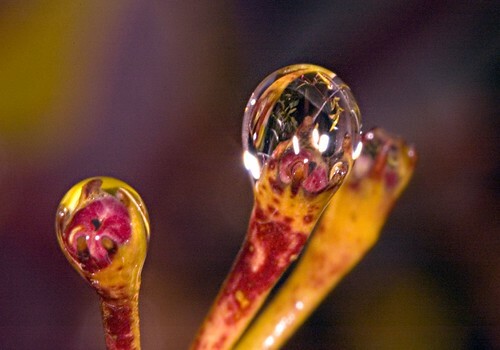 If you’ve been reading this blog, you’ll know that I’ve been photographing water drops lately. Outdoor photography of water drops with the speedlight kit has one great advantage, and one big disadvantage. The good news is that you don’t have to worry about your subject moving in the wind, the bane of the outdoor macro photographer (since even slight movements are amplified when you get up close). The duration of the flash is the duration of the exposure. However, not only is the flash the duration of the exposure, it is also the light source of your composition (in addition to ambient light, depending on where you set the aperture). This means that those lovely reflections you see in the minature water drop probably won’t be in the flash photo you take–and it is hard to tell in advance what will be there (even the LCD viewer can only give you a general idea with this kind of work). The photo at the top of this story was taken with the R1 speedlight kit, my D70 and 200mmf/4 macro mounted behind a 36mm Kenko extension tube, all on a tripod. One of the SB-200 units was mounted on the ring at the end of the lens, I handheld the other unit off to the left. It’s this second unit that causes the burst of light you see on the water drop. The aperture was set all the way down at f/40 (the camera picks a nominal shutter speed of 1/60 of a second, but the actual exposure duration is that of the flash). This extreme close-up of a poppy in my garden showing the texture of my poppy was also taken with the straight macro rig. 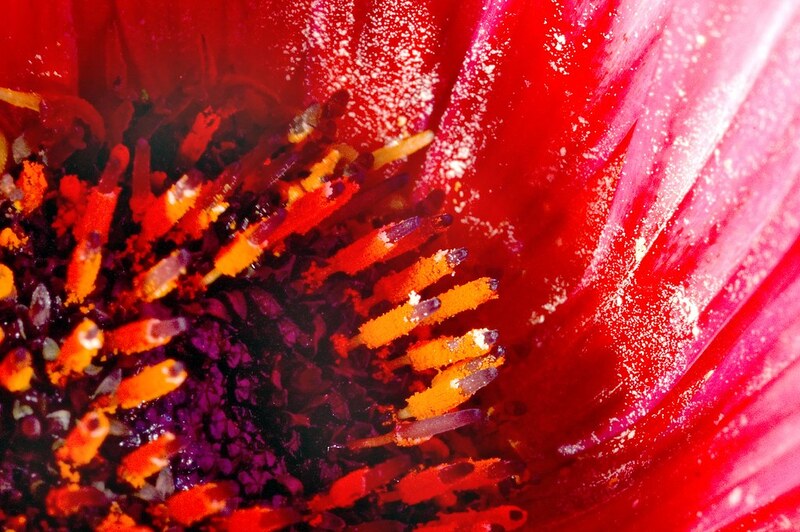 The poppy close-up that I blogged recently is another example of the impact of mounted both strobes on the front of the lens, and shooting without any other attempt at creative lighting (scroll to the bottom of the story to see the shot created with flash). Pretty soon, at least if you are like me, you’ll want to start fooling around with the elements of the macro speedlight kit to see how you can use them more creatively than the out-of-the box strapped to the end of the lens approach. 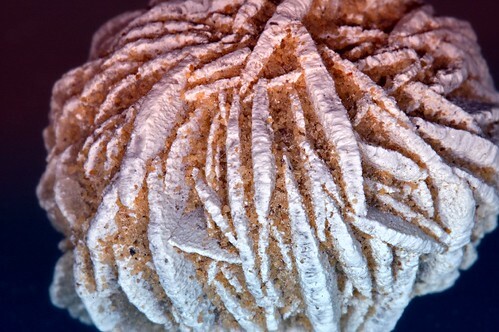 This photograph of desert rose quartz was taken in my little macro studio area, with the two speedlights off-camera on their stands, and using colored filters that come with the speedlight kit to cover each flash. One flash, nearer and on the right, was covered with a blue filter. The other unit was positioned back and behind and to the right, and covered with a red filter. You need to note that the photo shows individual grains of sand between the quartz to see how close this image is. Further along the experimental garden path, with this photo of an iris leaf, I placed the strobe units off-camera beneath the petal. So the photo is lit by ambient light and the light coming through the petal. 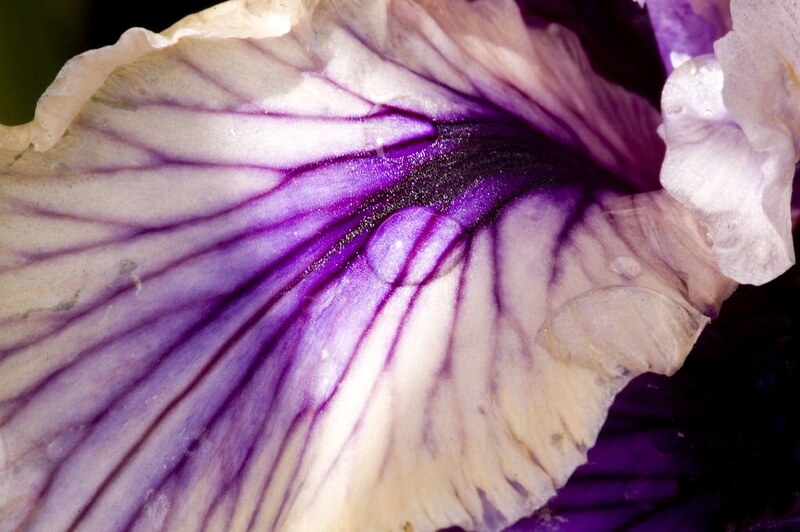 Probably, an iris petal as never seen before! 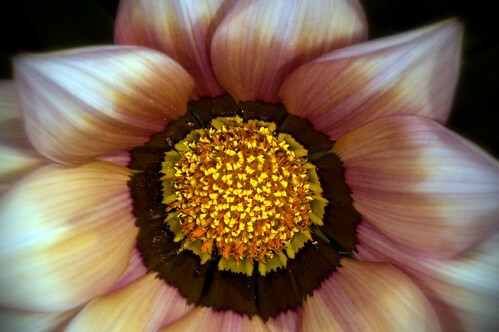 Dahlia, photo by Harold Davis. View this photograph larger. 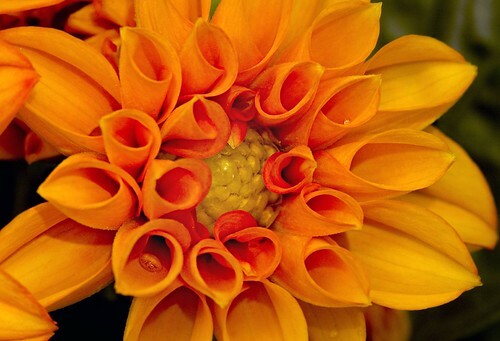 The Dahlia is a wonderful flower. It’s elegant, almost baroque, and at the same time somehow simple. If a rose is Mozart, and a peony Schubert, then a dahlia is straight Bach. My only complaint about the Dahlia is a gardener’s complaint: this climate is prone to snails, I can’t control the snails in my garden, and the snails simply love my Dahlias. The fondness of these vicious little animals for the Dahlia makes it hard for me to find specimens perfect enough to photograph in their macro and micro wonderfulness. Gardeners around here tell the story that snails are not native to California. Supposedly, all our snails descend from some escargot imported by a fancy gourment restaurant. Probably the Chez Panisse of its day when Chef Alice Waters was still in diapers. I know this sounds implausible, but it makes us gardeners smile as we try to defeat our rapidly multiplying slithering foe with products like Sluggo or Es-Car-Goe–and, probably with more effectiveness, saucers of inexpensive smelly beer. There’s something a bit heroic about the effort if we are trying to defeat a wily illegal alien–with a French accent in its shell and slime–rather than a respectable California native. When I photographed this Dahlia, its symmetry was intact. 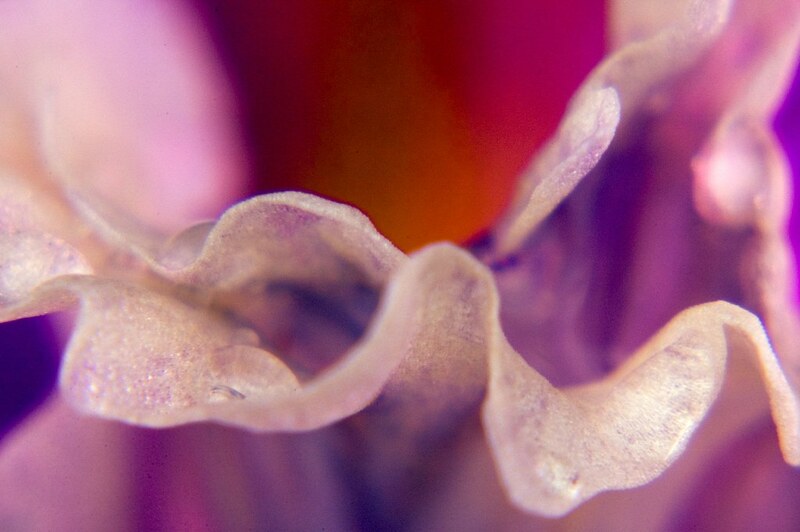 I positioned myself at a slight angle to the flower, and used my 200mm macro lens stopped all the way on a tripod to maximize the three-dimensional effect of this flower-as-sculpture.